Master Wu Nanfang is a Kung Fu master and also a Zen master, who lives in the town of Dengfeng, in Henan province, China. The town might be small, but there are more than 40 Kung Fu schools there, because of the proximity of the famous Shaolin temple. 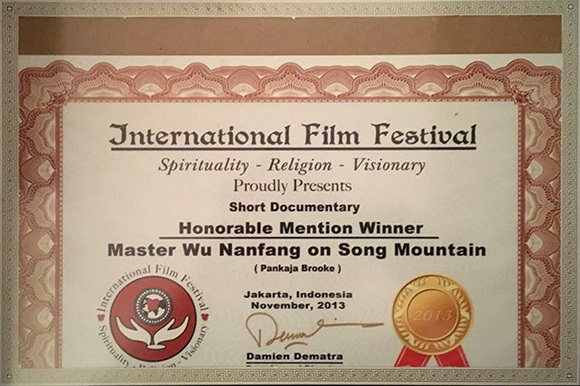 This short film shows Master Wu Nanfang walking out of a valley in the depths of Song Mountain, the central one of China’s five sacred mountains, on the way to his own school – where his students practice a more internal form of Kung Fu rather than the fighting and acrobatic forms. We see the Master teaching some fighting applications, and then, perched on a terrace above Zhongue temple, one of the oldest Taoist temples in China, two students give a demonstration. Wu Nanfang then shows how the Kung Fu principles of centeredness and awareness which are used in fighting, can also be used by farmers as they work the land. He himself, balanced precariously on a crag in the centre of this ancient mountain demonstrates some amazing sword and hand forms, illustrating how profoundly the practice of Kung Fu is connected with meditation. Finally, although it is snowing, he shows a chilly and not overly enthusiastic young student the art of calligraphy, an art which uses the same skill and presence as Kung Fu itself.